Having the right charger at hand, when you need it — and a spare socket in which to plug it — may sound like one of life’s easier challenges. But when you own more than one gadget, or have a family’s worth of gadgets charging at the same time, it’s sometimes far more difficult to juice up. 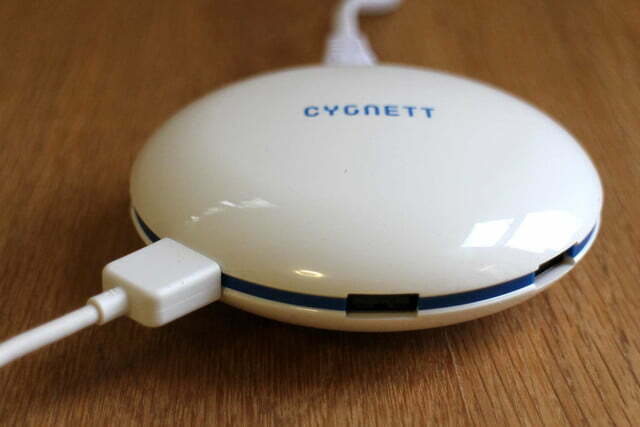 That’s where multiple device chargers come in handy, and we’ve been trying out the Cygnett Supercharger UFO, the latest multi-device charger to hit the market. 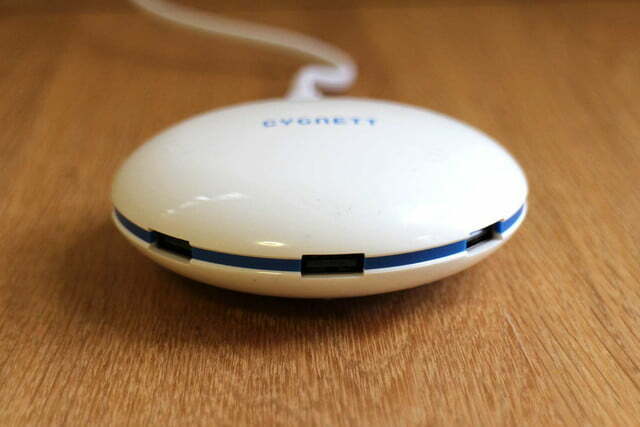 It’s called the UFO because its disc shaped design looks like a space ship. 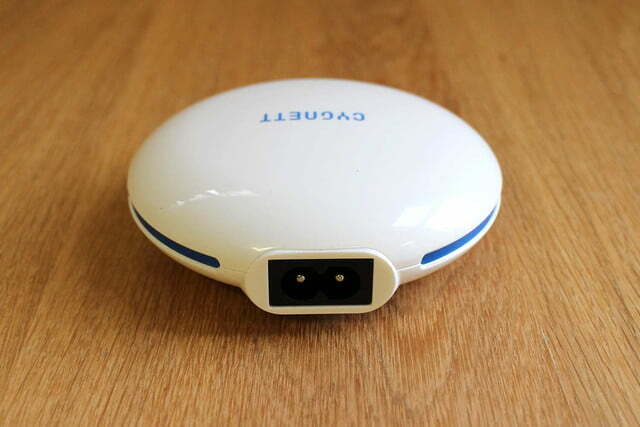 It’s sold in both black and white color schemes, with five USB ports placed around the side. The Supercharger takes up one power socket, but can charge up five devices at the same time, making it far more efficient than using five separate chargers in five different sockets. The Supercharger has a 5.0A output, and it intelligently recognizes when you plug in a device that supports fast charging, then supplies it with the right amount of power. 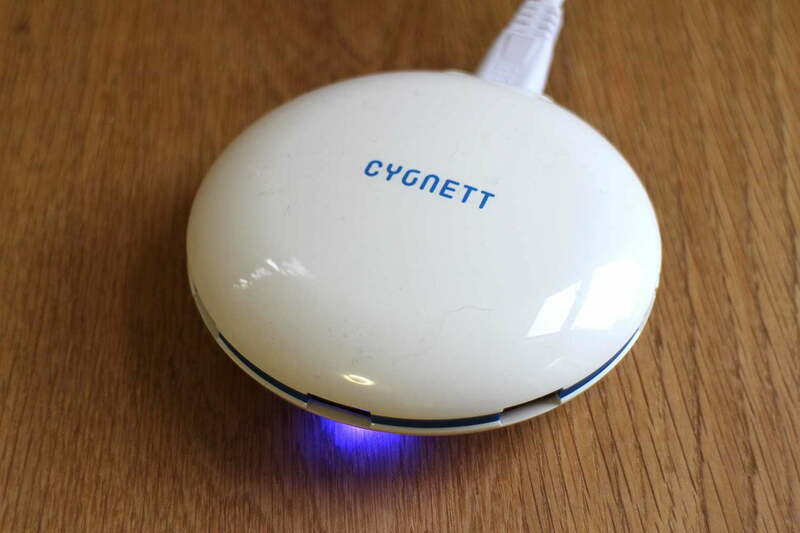 We’ve been using the Cygnett Supercharger for a couple of weeks, and it has proven very helpful, mainly due to its willingness to quick charge compatible devices whenever possible. 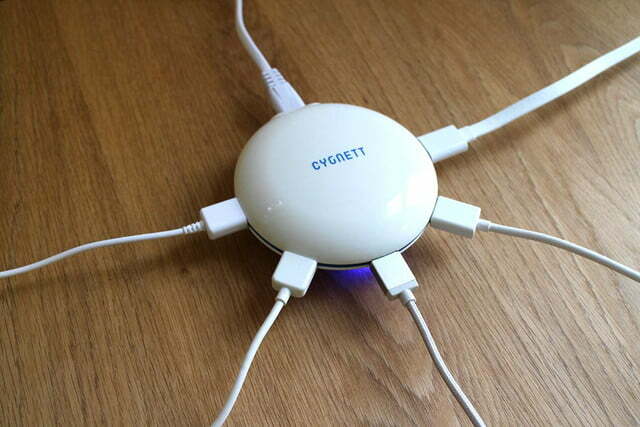 It takes up one power socket, but can charge up five devices at the same time. 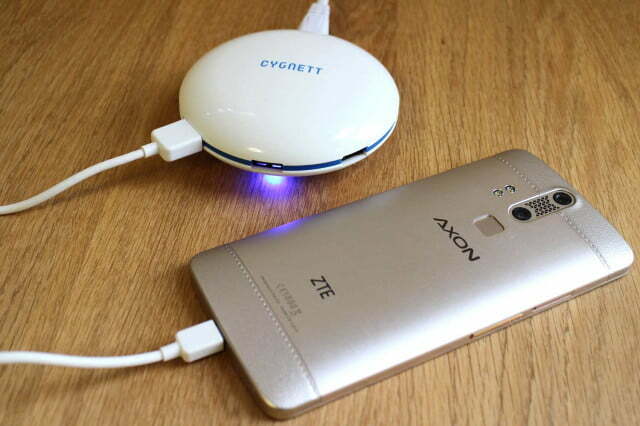 Charging the Samsung Galaxy S6 Edge Plus with the official fast charger typically takes 70 minutes from about 20-percent power. With the Supercharger UFO, it took almost the same amount of time, even with a OnePlus 2 and LG Watch Urbane charging at the same time. Plugging in five gadgets at once obviously slows it down a bit, because the charger only has so much power to give, but the difference is negligible. 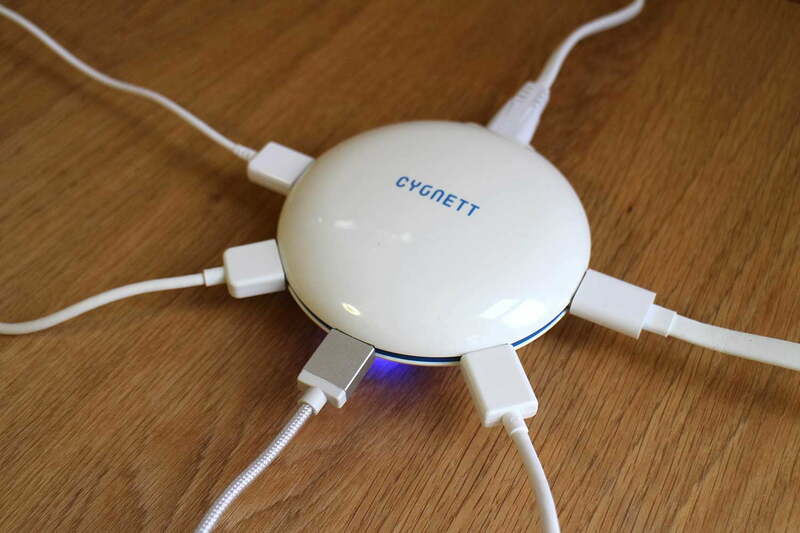 The spaceship-like charger remained at a constant temperature even while charging five devices all at once, which is no easy feat. 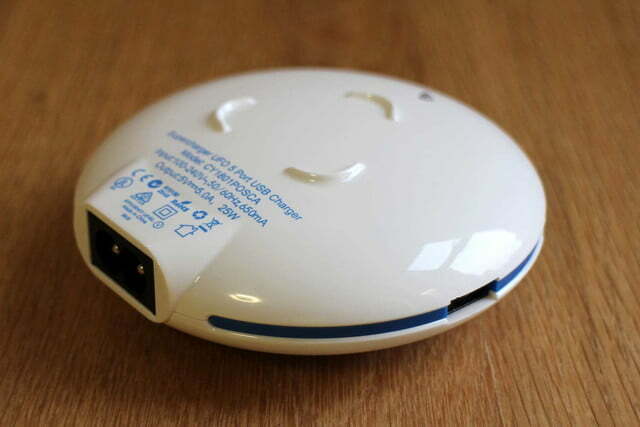 Even standard wall adapters are wont to heat up charging one device. 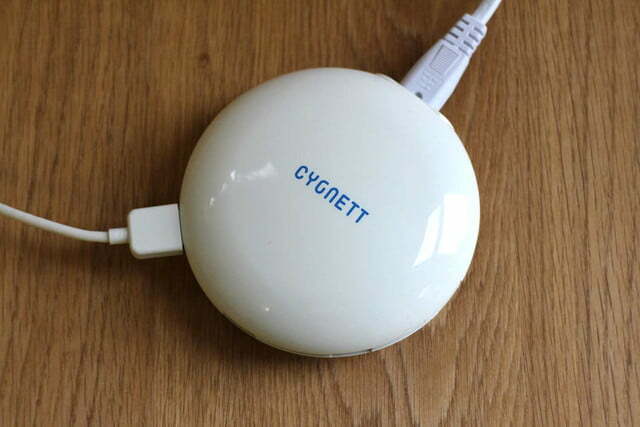 The design is attractive enough for a charger, and the white plastic is smooth and shiny on our test model. The simplicity is a bonus, and it blends in happily whether it’s placed in the living room, kitchen, or office. 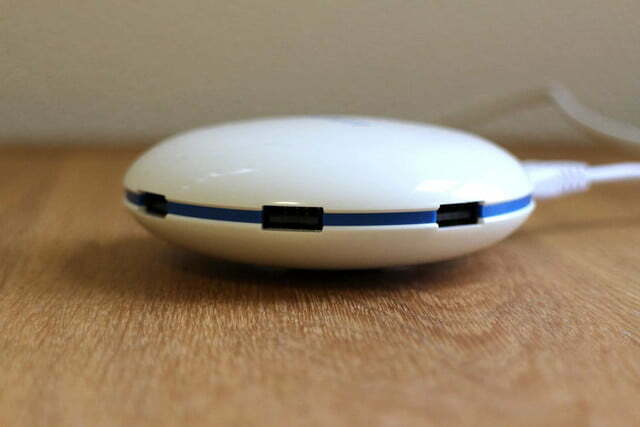 The spaceship-like disc remains steady when placed on a flat surface, and the cables are separated from each other at the base of the charger. However, once you’ve got everything plugged in, the Supercharger quickly becomes the center of a whole mess of cables, particularly if the wires are long. It can create something of a tangled nightmare, and if you have it sitting on the floor, it’s not only unsightly, but also a bit of a trip hazard. To show everything is working as it should, there’s a blue LED light on the base, and it’s incredibly bright. You won’t need a nightlight if you use the Supercharger in a bedroom, but you may want to hide it away unless being bathed in a blue glow all night fulfills your sci-fi dreams. 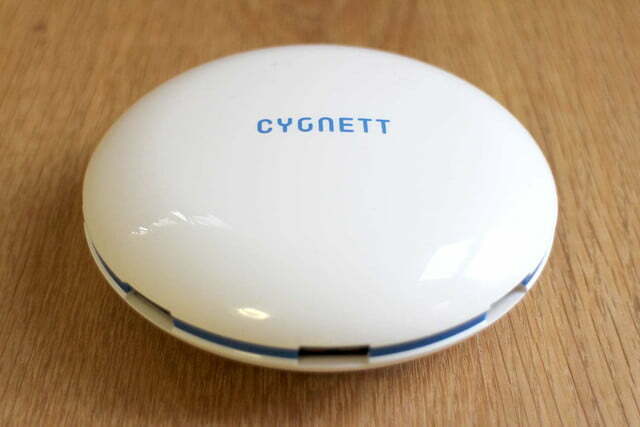 However, it costs just $40 in the U.S. or £30 in the UK through Cygnett’s own website, which considering the price of official replacement chargers that only offer only a single port, isn’t very expensive. Fancier multi-device chargers like the Alldock, which is up for funding on Kickstarter, will cost you around $130, if you get the early bird price. Even most simple ones cost at least $50 on Amazon and don’t support quick charging, so the Supercharger is a good deal, comparatively. Chargers aren’t especially exciting, and they don’t need to have an incredibly flashy design. Chargers just need to work, and if they make juicing up our gadgets easier or faster, then we’re happy. The Cygnett UFO Supercharger does both, and at a reasonable price, so we’re pleased to recommend it to anyone trying to simplify charging multiple devices at once.